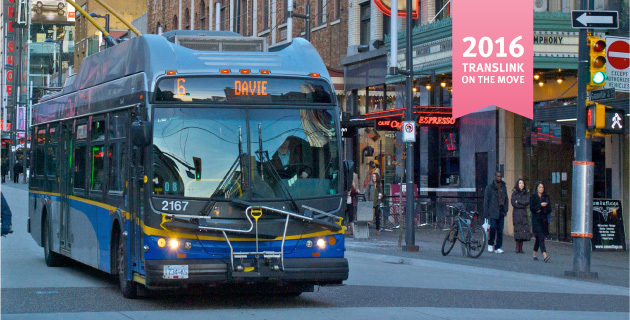 Today wraps up our TransLink on the Move series. Over the past five weeks we’ve shared bite sized pieces from our 2016 Annual Report – Mark III SkyTrains, Evergreen Extension Stations, Ridership numbers, Compass, and now Transportation Investment. You’ve likely heard about The Mayors’ Council’s 10-Year-Vision. Implementing this plan was the first step towards bringing Metro Vancouver the biggest transportation expansion in nearly a decade. With $2 Billion invested in transportation services, Phase One of the plan addresses some of our biggest rider complaints and aims to both reduce overcrowding on our transit system and ease congestion on our roadways. But there’s more to Phase One than new transit services and improvements. This first phase has additional region-wide impacts to alternative travel modes like cycling and walking paths, that brings real improvements to the way Metro Vancouver residents travel. The next 10 years promise big things for transportation in Metro Vancouver and we hope you come along for the the ride.